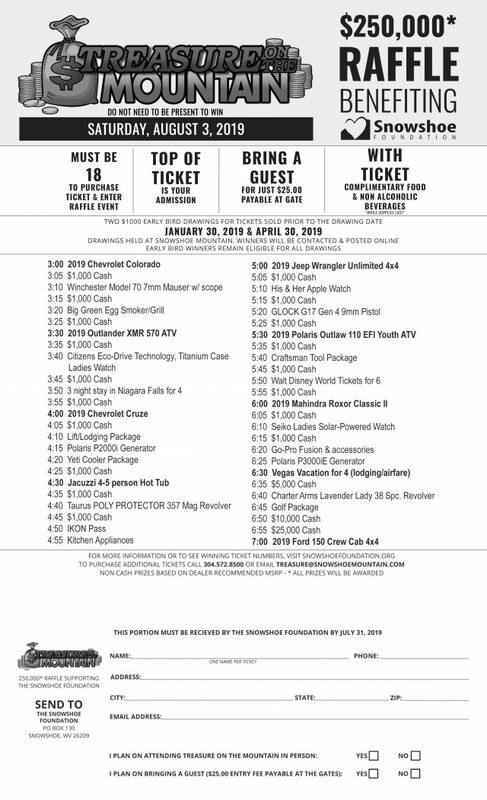 Tickets are almost ready for the 2019 Treasure on the Mountain. If you would like to pre-order your ticket, please call 304-572-8500. Our wildly popular raffle party is held on the top of Snowshoe Mountain, where you will have the opportunity to experience incredible food and drinks from many local, non-profit organizations, awesome entertainment, and the company of hundreds of excited patrons in a festive atmosphere. Our MC keeps this 21 and up party going with regular and side prize drawings every five minutes throughout the entire day. We invite you to experience euphoria with us on August 3, 2019. There is truly no other experience quite like the Treasure on the Mountain Raffle. Don’t miss out on the chance to have one of the best times of your life! It is mind-blowing! When you purchase a raffle ticket for the Treasure on the Mountain Raffle, you gain entry into the greatest raffle party in West Virginia. We have taken the raffle to the next level by adding an app to the fun. 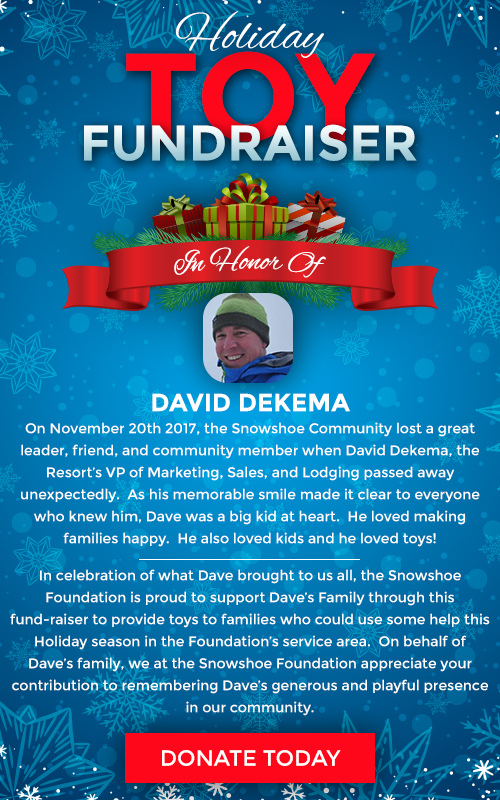 Now through our Snowshoe Foundation’s custom app, you can get live updates right to your phone during the event on or off the mountain. We know you want to be here on West Virginia’s most wonderful mountain with us (and we hope you can join us), but even if you cannot make it, you can still win exciting, high-end prizes! 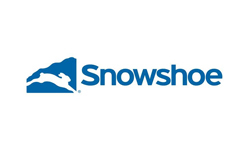 Treasure on the Mountain Raffle is sponsored by the Snowshoe Foundation, as well as the generosity of our additional sponsors. If you would like to pre-order your ticket, please call 304-572-8500..
Purchase your raffle ticket(s) by clicking here. You can also visit several local businesses that sell the tickets. Hurry, get your tickets today! By giving a chance to those in need, you also get a chance to win many valuable prizes. Buy your tickets early for a chance to win $1,000! To be eligible for the early bird drawing tickets must be purchased by 9:00am the day of the drawing. The drawing is held at Snowshoe Mountain. Winners will be contacted & posted online. Early Bird winners remain eligible for all drawings. Win Raffle Prizes All Over the Country! The crowd on Snowshoe Mountain grows into the thousands as excited folks try their luck at winning some really great prizes. 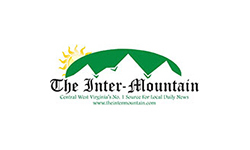 Winners from West Virginia, as well as across the country, including Colorado, North Carolina, Virginia, and Missouri, claimed over $260,000 in prizes last year. Raffle winners are announced every five minutes for four hours. Great food will be available all afternoon, with delicious favorites provided by local charitable organizations. Enjoy a Smörgåsbord of just about every type of food you can imagine! Try a walking taco from the Webster Springs Volunteer Fire Department, pork loin sandwiches from Tygarts Valley Lions Club, chicken from the Elkins Band Auxiliary, pepperoni rolls from Tygarts Valley High School, corndogs from Elkins Kiwanis, pork rinds from Durbin Lions Club, and popcorn from Marlinton Women’s club. 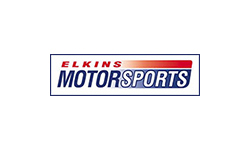 Elkins Middle School will be serving up ice cold Zul’s lemonade, also. There is so much more. Guns for the raffle are provided by Phillips and Sons Pawn Shop. Interested supporters, present or not, are invited to experience the thrill of the continual drawings by receiving notifications from the Raffle App. We need volunteers and sponsors every year to make our raffle a smashing success and continue to be one of the biggest and best raffle parties around. We value our major donors, as well as donations in any amount, in-kind donations, and services that we receive from the many businesses and individuals whose commitment helps us tremendously. No donation of time, money, or resources is too small! From gift baskets to gift cards, beach chairs, camping equipment, wine, and books, to vacations, vehicles, and cash, every generous donation helps. If you are interested in donating or volunteering at Treasure on the Mountain, please contact us at: (304) 572-8500. 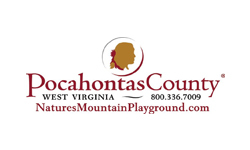 2019 Treasure on the Mountain Winners will be announced on this website, on our Facebook Page, and via the live app. 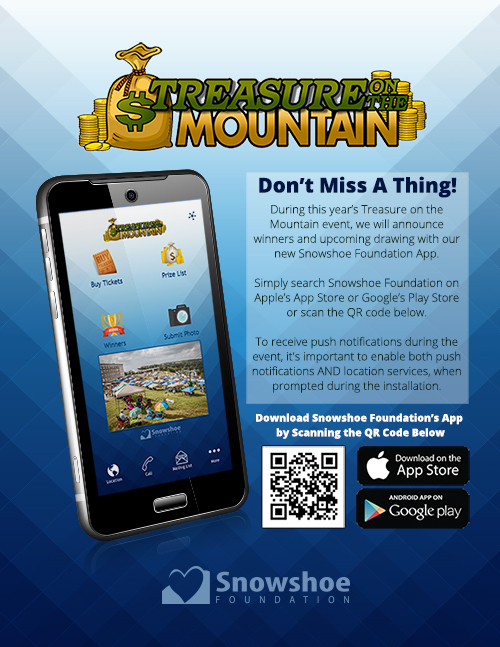 With the Treasure on the Mountain live app, people across the country who cannot attend are able to participate and receive notification of prizes won. Download the app regardless of attendance to receive prize notifications. 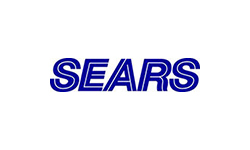 Error: Error validating access token: Session has expired on Sunday, 21-Apr-19 13:27:38 PDT. The current time is Monday, 22-Apr-19 14:46:19 PDT.